The Finnish Meteorological Institute has developed a plasma brake capable of reducing the amount of debris left in space. Using the plasma brake, satellites can be returned to the atmosphere after their service life. To stop space debris from increasing, satellites should be deorbited in a controlled manner after their mission has been completed. The plasma brake developed at the Finnish Meteorological Institute may prove to be a new and efficient method for returning a small satellite to the atmosphere. "In principle, the deorbiting device could be, for example, a braking rocket, but especially for small satellites, the inclusion of a rocket engine would increase total costs considerably. The plasma brake developed at the Finnish Meteorological Institute is a negatively charged tether made of a thin metal wire. Interacting with the ionosphere, the tether reduces the satellite's speed so that its orbit falls gradually," says Pekka Janhunen, Research Manager at the Finnish Meteorological Institute. It is estimated that, depending on the size of the satellite, a plasma brake would weigh only a few hundred grams. The device is about ten times more efficient than the previously known electrodynamic tether. The plasma brake tether is so thin that it poses no risk to other satellites. The plasma brake was invented at the Finnish Meteorological Institute by the same group that previously invented the electric solar wind sail, a revolutionary propulsion method for planetary probes that is now being developed in Finland and elsewhere in Europe. Both inventions came about as by-products of academic basic research into space plasma physics and auroras, which the Finnish Meteorological Institute has conducted for over 20 years. 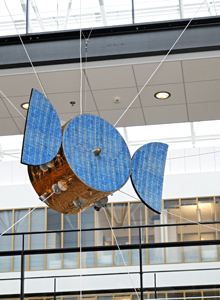 The plasma brake and the electric sail will be tested on the Estonian ESTCube-1 nanosatellite to be launched in 2012.